We’ve compiled a list of commonly asked questions on Bauma 2019, to make this colossal trade fair a little more manageable! Bauma is the world’s largest construction and mining trade fair. It features a who’s who of global industry leaders. It’s unmissable and an efficient way of seeing all the industry has to offer, in one massive venue! It takes place over a full 7 day week and due to its enormous scale, don’t expect to see everything in one day. Bauma takes place once every three years. This year, Bauma will be held on 8 – 14 April. Where does Bauma take place? The address for Bauma is: Neue Messe München, Messegelände, 81823 München (Munich), Germany. What are the opening hours for Bauma? Where can I get tickets for Bauma and how much are they? Latest Bauma ticket prices can be found here. Where can I find the Bauma exhibitor map/ floorplan / list of exhibitors? Click here for the map/ floorplan. Where can I find details on Bauma parking? The Messe München trade-fair center lies right on A94 freeway to the east of Munich. There are dynamic signs displayed on the freeway, just follow these to the various parking areas with available spaces. What is the Bauma Selfie Tower? The ‘Bauma Selfie Tower’ is a 54 m² viewing platform, 22 m high in the air, offering spectacular views over Bauma. It’s a great opportunity to truly appreciate the scale of Bauma (and also to get your bearings!!). Find it in the outdoor exhibition area north near the north/east entrance. 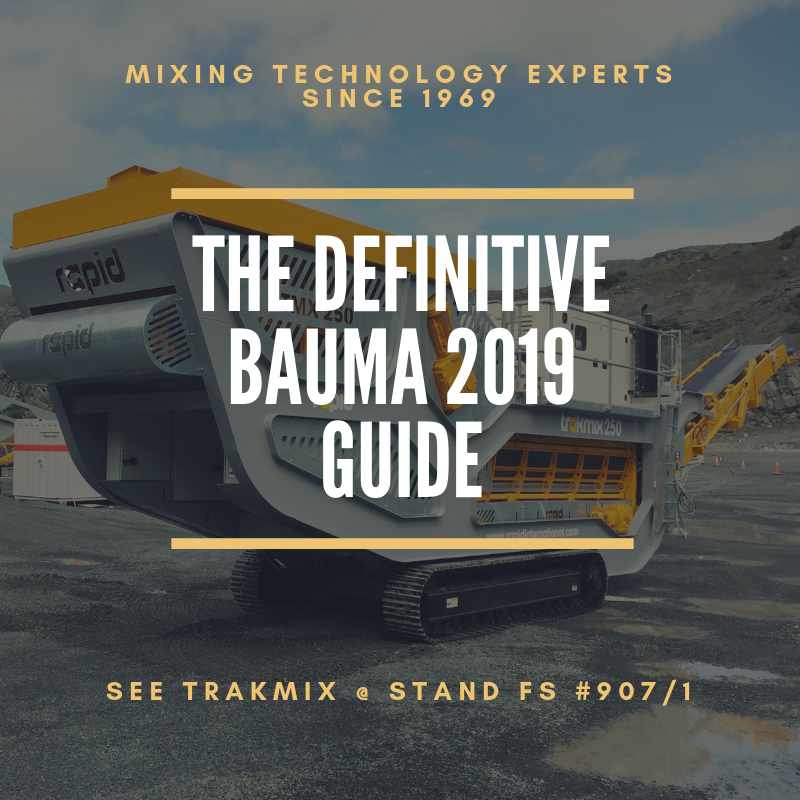 We hope you’ve found this guide useful and enjoy your experience at Bauma 2019! 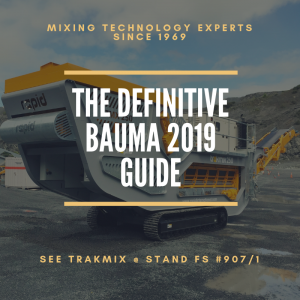 You can find team Rapid at Bauma 2019, in outdoor area FS at stand number 907/1. We’ll have the innovative Trakmix, track-mounted mobile continuous mixing plant/pugmill on display and our friendly team will be on-hand to offer the best mixing technology advice for your application.